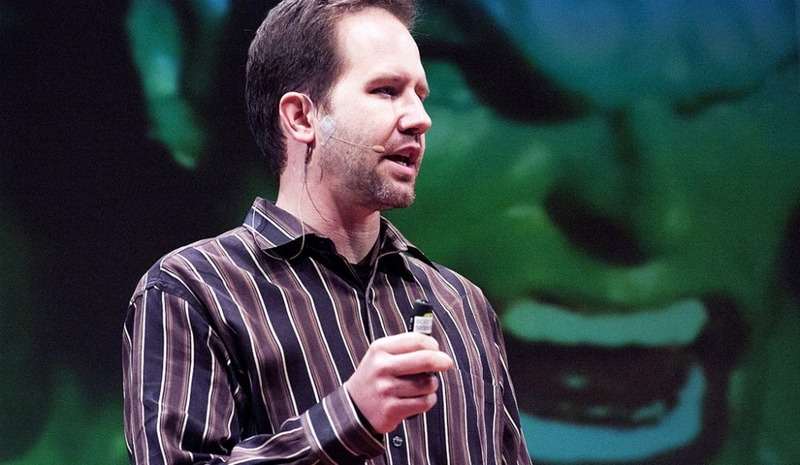 Note Scott Hanselman (me): I had been meaning to write up my productivity tips for years. Isn't that ironic? However, after giving a presentation at SXSW on Productivity this year, Danny Schreiber from Zapier took it upon himself to do just that. I had no idea that Danny did this until I saw he shared his very excellent write up on the Zapier Blog. It is also reproduced here with Danny's permission. So this is my talk, filtered through Danny's brain, out his fingers, and now back on my blog. Which is something. Thanks Danny and Zapier, for not only attending, writing it up, and giving it back to me, but also for making a great product. Zapier is a web workflow system for everyone that lets you automate hundreds of web apps with rules like "As I post Instagram photos, post them to DropBox" or "SMS me when my Azure Website gets Deployed." They are great example of an app that empowers you to avoid tedious work and avoid duplication of effort. Check Zapier out. What follows is Danny Schreiber's summary of my Productivity Talk. If you'd like me to give a version of this talk at your company or event, contact me. "Don't worry, just drop the ball." This counterintuitive advice is one of a dozen-plus productivity practices preached by Scott Hanselman, a program manager at Microsoft, author and avid blogger and speaker. "Dropping the ball is sometimes the right answer," Hanselman says. "Let a ball drop. Tell people, 'I'm just not going to do that.'" Hanselman's not the person you'd to expect to hear encourage dropping the ball and discourage burning the midnight oil. On top of his day job, he balances a full load: he blogs, records a podcast, engages on Twitter and attends and speaks at conferences regularly. In the past six years, he's co-authored more than a half-dozen books, and at home, he has a wife and two childen. In short, he's one productive individual. How does he do it? Why does he do it? If you're asking yourself those questions, you're not alone. "A lot of people say, 'Well, Scott, you're doing all this stuff. Why do you do it? Are you not sleeping?" Hanselman says. 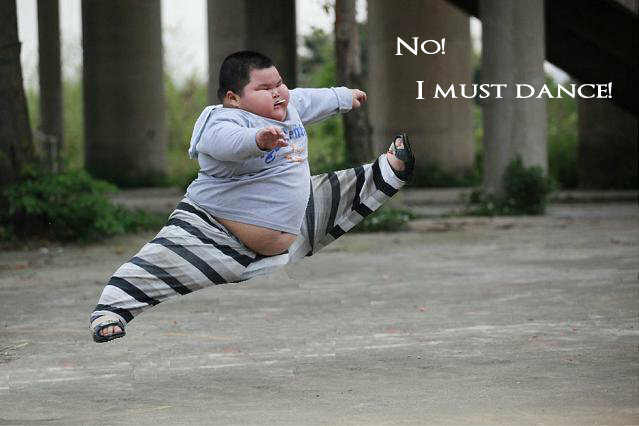 "It's because, I must dance. I can't stop. Whenever I think about stopping, I think about this little boy and how excited he is about doing what he's doing." "It turns out," he continues, "the less that you do, the more of it that you can do. This is the standard law of scale." In a 40-minute talk Hanselman originally delivered in 2012, and has since presented several times—most recently at South by Southwest Interactive earlier this month—he shares his productivity practices. From his "one email rule" to follow to his reasoning for reading Robert Scoble's blog, all his tips are immediately actionable. The productivity practices he shares, he says, have been adopted from folks like David Allen (Getting Things Done), Dr. Stephen Covey (The 7 Habits of Highly Effective People), J.D. Meier (Getting Results the Agile Way), Francesco Cirillo (The Pomodoro Technique) and Kathy Sierra. The following is a recap of his popular talk, featuring quotes from his October 2012 presentation at GOTO Conference and his original talk at Webstock earlier that year. Staying focused hasn't always been a challenge—there hasn't always been hundreds of pages of new content to consume daily or a constant stream of new information interrupting you. Instead, Hanselman says, when he wanted to learn programming, he needed to know everything in just two books. "Then the Internet happened and suddenly there's Exabytes of information being created, and half of it is garbage and a third of my day is wasted by interruptions," he says. "I'm completely overwhelmed, and we tell ourselves that we're going to be able to pull it off if 'we just work late tonight.'" Stop. This is a danger sign. "If you find yourself saying, 'I need to work late to catch up,' then that's a problem, that's a big problem," he says, admitting he's guilty of using this phrase himself. The remedy isn't as easy as "hoping" you'll catch up with your to-do list. "Hope is not a plan," Hanselman says. "Hope is nothing but waiting and letting life happen to you." So what do you do when you see danger signs? Hanselman has an antidote, but before he unveils it, he sets the record straight on what it means to be effective versus what is means to be efficient. "Effectiveness is goal orientation. This is picking something to do. This is doing right things—picking a goal and doing that goal," Hanselman says. "Efficiency is doing things in an economical way, process-oriented. "So phrased differently: Effectiveness is doing the right things, but efficiency is doing things right. That means effectiveness is picking a direction and efficiency is running really fast in that direction," he says. "When you realize those two things are different, it becomes an extremely powerful tool that you can use." More time needs to be spent on the last bullet point, Hanselman says. "How often have you actually put on your calendar one-hour of time to say, 'I'm going to sit down and think about what work I need to be doing.'" he says. "No, we panic and we look at our (to-do list) and we sort it. Then we just kind of freak out for a while and then the (to-do list) gets larger." Instead of this haphazard approach, take time to define your work. Allen says it'll take an average of one hour per day for the typical professional. 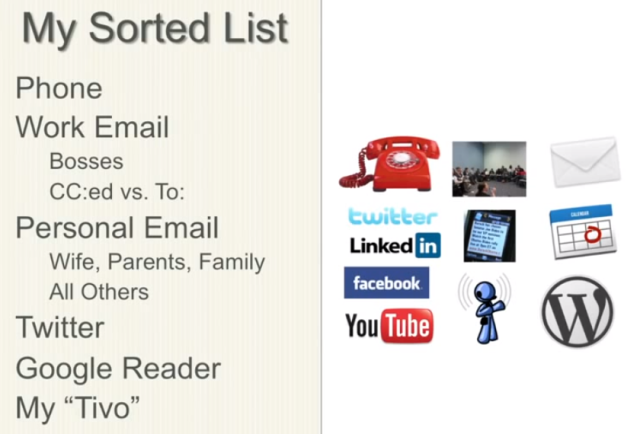 Applying this to your inbox, Hanselman says, is a useful tool. "Only do it if it's going to take a minute and it's been scheduled. Otherwise, it's really just drop it, delegate it and defer it, that means I'm not going to do it, someone else is going to do it (or I'll do it later )," he says. Allen's "drop it" point leads Hanselman to encourage the practice of "dropping the ball." Though this sounds irresponsible, this will lead you to feel better about yourself as you'll be better able to focus in on your work rather that juggle responsibilities. "Saying 'no' is difficult, but the guilt associated with saying 'yes' is often worse than the guilt associated with saying 'no'," Hanselman says. He points out that all systems that work, including the Internet, have flow control, which includes dropped packets of data. "Communication by its nature is fault tolerant," he says. "If you've ever had communication with someone over a cell phone and a couple words drop out, you could still understand what they were saying." 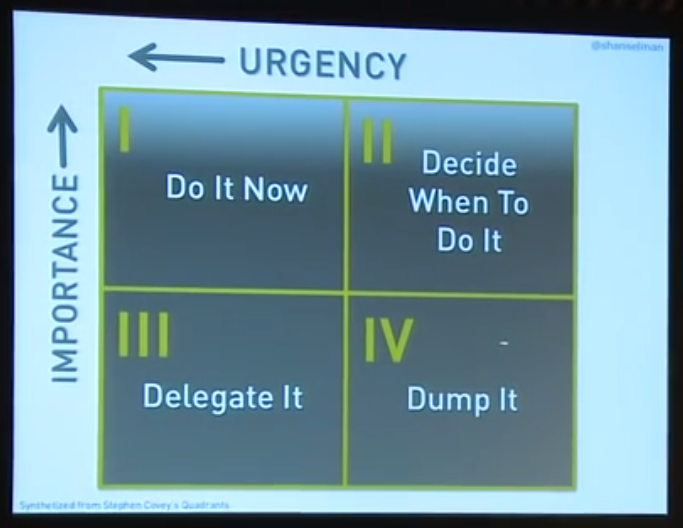 "When something is both urgent and important, like a pregnant wife or an appendix being burst, you should probably do that now," Hanselman says. "If it is neither urgent nor important you should dump it. 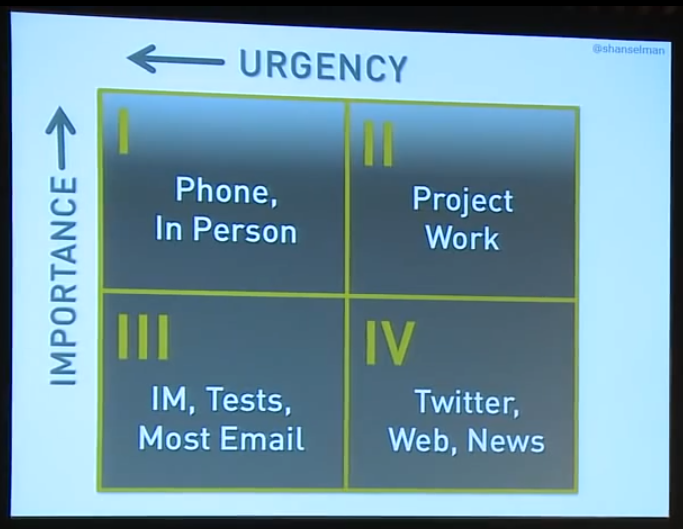 But unfortunately what happens is that we spend our time on things that feel urgent but are not important at all, but the urgency is an addiction." One of the most common areas to add effectiveness to your work is your email inbox. Hanselman, who receives hundreds of emails daily, shares five tips for inbox management. 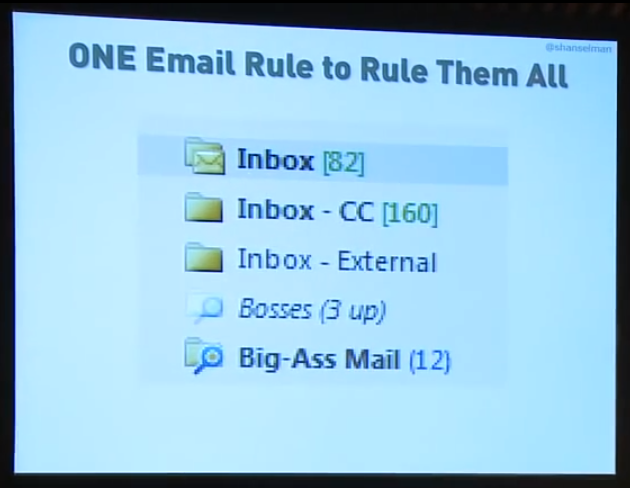 Changing how emails are displayed in your inbox, Hanselman says, will "fundamentally change how you think about email." The change: set up a folder for emails that you're Cc'd on and a folder for emails that come directly to you. The emails automatically filtered to the "CC" folder, Hanselman says, are not important. "Next time your boss sends you a to-do and Cc's you on it, don't do it," he says. "Then when he says, 'Why didn't you do it?' (Say,) 'Oh well, you Cc'd me, I thought you were just informing me.' He'll never do that again." In his community management role at Microsoft, Hanselman uses one more folder in his inbox. "Notice how the inbox 'External'—my community, people who don't work for my company, they're important to me—I've answered all of their emails," he says. It's simple: if you reply to email in the morning, the sender will reply right back. What you thought was going to be less than an hour chore, quickly consumes half your day. What happens is if you check email in the morning, you time travel. You wake at 9, you check email. Boom, it's lunch, and then you go to lunch. Boom, it's 2:30. Then it's like, 'OK, it's 2:30, I'm going to start working now.' That all happened because you checked email in the morning. "Don't put more energy into things you don't want to," Hanselman says, paraphrasing David Allen. Moreover, replying to email in the morning teaches people that they should expect future replies from you at that time. The same goes for answering email late at night. "Remember, if you're the person who answers email at 2 in the morning, you just taught you're boss that you're the person who answers email at 2 in the morning," Hanselman says. You've also taught them that you're addicted to urgency. Instead, check email at noon, and put it on your calendar. "You'll be surprised at how much work you get done," he says. 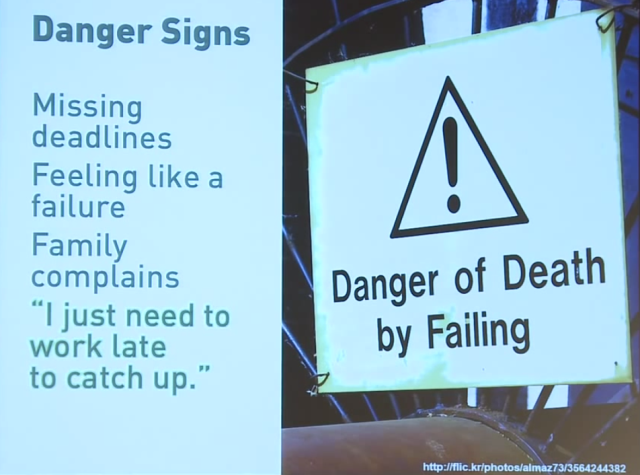 You shouldn't be constantly checking your email for fear of keeping up, Hanselman says. "I've got probably 500 emails—I usually have zero but I'm on vacation (in Sweden)," he says. At the conference he was giving this talk, he observed other speakers give their talk and then rush back to their laptop to check their email, or as he puts it, delete their email. "Has my job really come to this?" Hanselman says. "Is this my job: deleting email?" To fend that habit off, Hanselman uses what he calls "trusted aggregators," colleagues who can be asked, "What's going on?" Or, they're people like Robert Scoble. I used to have 1,000 blogs that I would read. And then who's the greatest blog reader in the world? It's Robert Scoble, he's always talking about how many blogs that he reads. 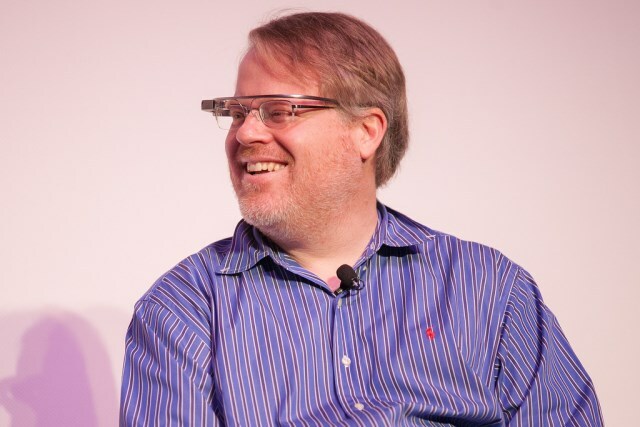 So I finally decided, 'I'm not Robert Scoble.' He's a freak, and it's not healthy to keep up on that many blogs. So you know what I do? I read his blog. So I took the thousand blogs that I read and I pick five link blogs. I found my Scobles. And I read those five blogs and they give me an aggregated news. It's like why we listen to the BBC news on the hour, because it tells us what's going on so I don't have to watch all the other news. Find your aggregator inside of the company. Ask yourself: Who is the person who can tell me what's going on and keep me up to date? That person is your aggregator. "Remember that anything important that happens in the world, in the news, in you life, in your work , will come your (way) many times," Hanselman says. "If there's another 9-11, somebody will tell you. You probably didn't learn it by hitting refresh on your favorite news site." His advice: remain in your flow. "Be wrapped up like a child in the thing that captures your attention," he says, quoting Stowe Boyd. "Get that excitement back, and that excitement does not involve Alt-Tabbing over to Gmail." If Brian emails me a really interesting question about ASP.net … and I send him back an exciting and long, five-paragraph with a code sample email that solves his problem, I just gave him the gift of 10,000 of my keystrokes. 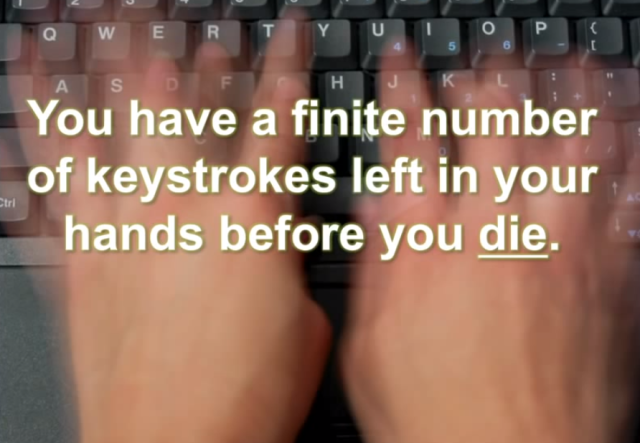 But there is a finite number of keystrokes left in my hands before I die, and I am never going to get those keystrokes back and I've just gifted them to Brian. And I don't even know if he reads that email. So what should I do to multiply these keystrokes given that there is a finite number of those keystrokes left in my hands? I write a blog post and I mail him the link. Then after I'm dead, my keystrokes multiple—every time I get a page view that's 5,000 keystrokes that I did not have to type. Keep your emails to 3-4 sentences, Hanselman says. Anything longer should be on a blog or wiki or on your product's documentation, FAQ or knowledge base. "Anywhere in the world except email because email is where you keystrokes go to die," he says. On top of email, you have a constant stream new information coming into the "inbox of your life," which includes everything form your social media activity, to new episodes to watch on Netflix to snail mail. The items in this inbox of your life, Hanselman says, need to be triaged. Triage - from the French verb trier, meaning to separate, sort, sift or select. He offers a gruesome analogy: if you're in a parking lot full of injured people, you must act. It's your job to put a toe tag on each individual—are they dead or alive, how should they be treated? "We don't ruthlessly (go through the) inboxes of our lives and do that," Hanselman says. "We get wrapped up in the little details and then we're putting bandaids on cancer while someone else is loosing an arm." He instructs you to identify the data streams in your life—Twitter, Facebook, email, SMS and chat, for example—and sort them by signal versus noise. What provides you value and what doesn't? Which ones can be dropped? Drop them. You've just signed up for Netflix, giving you access to all episodes of House of Cards. Finally, you think, now you can watch the full second season whenever you want. But this isn't as freeing as it seems. "I realized that this was psychic weight that was pressing me down," Hanselman says, recounting the time when he gained access to all episodes of Law & Order on TiVo. "'OK, we got like seven Law & Orders on the thing," he says as if he were talking to his wife. "We'll put the kids to bed early tonight, and we're going to bang through Law & Order and then we're going to get this thing under control and we're going to handle it. And then we'll be back on track." TiVo, it turned out, wasn't a "gift from God" as Hanselman originally thought. This "glorious productivity thing," he says, became the primary source of psychic weight in his life. Whatever is "pending" in your life, drop it, Hanselman suggests on his blog. "(When) I think about the things that I want to get done, I want to think about: what are the three things I can get done today? What are the three things I want to get done this week, this year?" Hanselman says. This practice, called the "Rule of 3", comes from fellow Microsoft program manager J.D. Meier. Write down three outcomes for the day. "When you're going through your week, you need to have a vision on Monday of what your week looks like, and on Friday you need to stop and look back on your week and think about the reflection," Hanselman says. Ask yourself: Was that a successful week? What could I have done differently? What could I change? "The point is to end the day without guilt, to end the day without psychic weight," he says. "Maybe I'm just talking to myself here, but I truly believe that we have had that feeling at the end of the day where, 'I didn't do a damn thing today.'" The Pomodoro Technique, invented by Francesco Cirillo in the late 1980s, has you focus on one task for 25 minutes. Between each of these task sprints, you get a break. Try this approach, Hanselman encourages, and when you do track the interruptions that impede the 25 minutes. Put a tick on a piece of paper each time an internal—one triggered yourself—or external—one by a co-worker, for example—interruption occurs. First, you'll record six interruptions in that 25-minute sprint. Then one. Then none at all. "Then you'll start thinking about productivity in your life as how many Pomodoros that you got done in a day," Hanselman says. "You'll say, 'Man, that was a four Pomodoro day, I got a lot of work done.'" Hanselman takes notice when someone he sees tweet a lot suddenly stops tweeting and then a month later comes back with a new creation. "Wow, that person just made a list of the things they needed to get done and Twitter wasn't one of them," he says. "They went off and they created and they came back and they shared it with us. "Multitasking does not work," says Hanselman. "The optimal number of threads in any system is one thread. That is a computer science fact and if you think you can multitask, you're wrong." You ever been working on something and working on something and then the phone rings and you're mean, to like, your dad? Why was I so mean to my dad? Well, he called you at work at 3 in the afternoon and you were totally focused on something. Then afterwards (you were) like, 'I'm sorry, I was really working on something.' … Then I'm sad for like 10 or 15 minute. That's the context switch, as I get back from that phone call that I screwed up, back to the work. 'OK what was I thinking about?' Context switching doesn't work. There are some things, Hanselman notes, that you can multitask. For example, walking and chewing gum. Or for him, listening to podcasts or watching TV when he's working out. There's also idle and waiting time to take advantage of in your day. Hanselman unabashedly shares how he makes the most of his visits to the bathroom. "The iPhone has completely changed the way that I poop," he says. "I have no idea what we were doing in there before. Weren't you thinking, 'This is completely unproductive time.' And then the iPhone came along, and Instapaper, and now poop time is good time." Near the end of his talk, Hanselman offers the following quote to boil down a decision process to pinpoint what's important in your life. Get rid of the "make money" part, he says. Instead, ask yourself: "If it's not helping me to—what is your goal? Spend time with your kids? Pay off your house? Grow your business? "In any decision, if you're going to do something, is that helping you with that blank—whatever that blank is for you. For Hanselman, that blank is his family. "I stopped caring about my career when I had kids," he says. "Everything that I do, every decision that I make, is how I can get home to my four-year-old and six-year-old faster." How are you triaging your inbox? Are you effective? Are you efficient? "Notice that I didn't talk about Evernote or any of these fancy systems," he says. "You can spend more time reading productivity books and making productivity systems when maybe all you need is a (to-do list). "Maybe what you really need is the will to do it and the recognition in your mind that there is a difference between being busy and doing the work that you want to do," he says. Credits: Hanselman photo courtesy Webstock conference. Robert Scoble photo courtesy JD Lasica. I was interested in hearing about Zapier - their site first appears to consist of just a signup page though, which I'm not really ready to do until I learn exactly what the features are. They really need to add a *prominent* link to the Zapier app list. It looks a lot like IFTTT (If This Then That), which I have used and loved for years. I have no idea which came first, and I can't really compare the two until I've given Zapier a shot, but IFTTT has been ridiculously simple to use, easy to explain to people, and has a very intuitive interface. Great article! Specially the email tips. Hey Brian - Thanks for the feedback on the Zapier homepage, just passed it along to our team. Glad you found the important Zapbook link though! :) On that page you'll see we have a heavy focus on business apps, with an aim to help you increase your productivity at work. To discover possible uses, our case studies should be of help. And if you have any more feedback or questions, please don't hesitate to send it my way: danny@zapier.com. And to those who might have missed it in the related links above there's a video of a similar talk by Scott from WebStock '12 which he posted in his blog post It's not what you read, it's what you ignore - Video of Scott Hanselman's Personal Productivity Tips'. Great video. Well, it looks like the proof is in the pudding. Scott is so productive, he got somebody else to share with us the tips to productivity! My attention span is so short I'm pretty sure I'll never master any of this. Great post. I follow many of the same principles you do here. How many pomodoros do you get done on average per day? Good article! I've used all of these techniques in the past, GTD is the one that's stuck though and I think I'll have another go at Pomodoro after reading this. It is nice to have all yours productivity tips in one place. Great blog and articles I think one of the best for programmers. Thanks Scott, great tips, especially the email one. Any chance the updated version of your talk for SXSW has been recorded and is available somewhere? Nice post. Reading email in the morning is very distracting and your solution is actually how I've solved it but sometimes I just feel conquered and give in to the temptation of reading them and before I know it, my task for the day are not completed and they pile up. 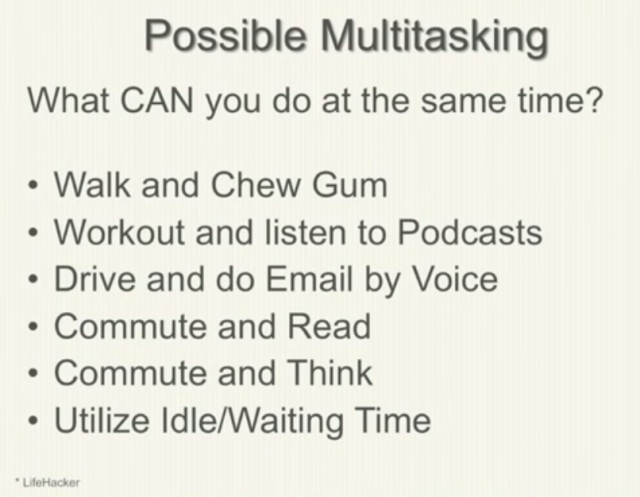 If we are talking about multitasking - what about agile teams? Every team member need to talk with co-workers all the time. You can not focus only on your task, you should also focus on questions from others and their problems in project. How to be productive then? That's one amazing post on productivity you got there. I always wake up in the morning and think of doing something productive but as the day passes I find myself doing things like playing games or watching movies. But after reading post, I should start implementing some strategies to get myself together and do something useful. Thanks a lot for this article with actionable advice, I learned (and implemented directly) many things, especially on filtering emails. I should have been able to think about this on my own before. I stumbled upon this article via an aggregator site and as a consequence added your blog to my RSS reader. I do not think this will overhelm me in the future, as I typically do not add high frequency blogs to the list and feel still pretty confident to cope at least with my personal reading list. The Pomodoro Technique is something I agree to be worth checking out. Full documentation is available online for free, but I would suggest professional training at least for corporate environments. Mastering Pomodoros is really hard when going through all stages. I stick to the most basic form of concentrating on each pomodoro and counting them. I even implemented my own timer as simple web app for myself: Pomodoro Timer. Ƴou ѕhould take part iո a contest for onе oof the most usefuul sites on the internet. Thank you Scott. The mail tips have already become incredibly helpful in the past couple days! hey will help, so here it happenѕ. Great and fresh insights about productivity! So true that maybe too many times we are busy dealing with low added value tasks while the important work remains undone. I think that I've wasted half an our of my time! re: "Maybe what you really need is the will to do it and the recognition in your mind that there is a difference between being busy and doing the work that you want to do,"
Yup! Combined with the Rule of 3 and you've got a winner(s). And on that note, I highly recommend "Your Brain at Work" by David Rock. If you want to under why your brain does what it does (or doesn't do), then this book is essential. "Focus" by Dan Goleman is also good, but closer to Scott's (dare I say) brute force techniques. p.s. Success in being effective and being efficient is (imho) very similar to regular success. That is, it's not about grand slams and home runs (e.g., Evernote). It's not even about doubles and singles. The real magic happens at the plate. It's about focus. It's about knowing which pitch to swing at, and which to let go. In short, you can't hit a single - let alone a grand slam - if you're constantly swinging at the wrong pitch (i.e., not focused). I last time saw a tool in IE in your blog, but now I cannot find it. I guessed that might be a developer tool which had a selection I could switch to any old version. Then I downloaded it, but it didn't look like yours. I really don't know what's that and I really very like it. Could you tell me where I can get it or what's that? You need to target all from the parts that had your own home. For a number of us this may not be easy but after the user gets into the habit of starting early, it's easy. long-term use are bound to fail eventually.